Wi-Fi – Why you need to be careful! As you know we make every effort in our GC Technology newsletters to bring you up to date information on what you should be aware of in the world of IT. On this occasion it’s all about Wi-Fi and more particularly about free Wi-Fi. With the dramatic increase in the use of smart phones, iPads, etc. the need for tighter security is more important than ever. Company and personal files are no longer kept under lock and key or inside the four walls of your business or home and it is not uncommon now for an employee to hold company data on a desktop at home, a laptop, an iPad or a smart phone be it IPhone, Blackberry or an android. In most cases a company’s security systems will protect this information but there is always an Achilles heel and that is “Free Wi-Fi”. Free Wi-Fi (Public wireless) networks are convenient, but if they are not properly secured, connecting to one might be risky. Just because most wireless networks have a firewall to protect you whilst connected to the Internet doesn’t mean you’re protected from others connected to the same network. Lots of wireless hotspots are completely unencrypted, so our recommendation is that whenever possible, only connect to wireless networks that require a network security key (password) or have some other form of security, such as a certificate. The information sent over such networks is encrypted, which can help protect your computer from unauthorised access. How you would know if security is configured on a Wi-Fi is when you select a wireless network from the list of available networks, each network will indicate whether it is either security-enabled or unsecured. If you do connect to a network that is not secure, you immediately run the risk that someone also using that free Wi-Fi, with the right tools can see everything that you do, including the websites you visit, the documents you work on, and the user names and passwords you use. You should not work on documents or visit websites that contain personal information, such as your bank records, while you are connected to that particular network. Our advice is where at all possible only use a third party broadband provider if a password is required. 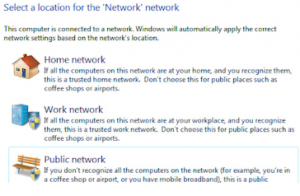 When you first connect to any given Wi-Fi network using a laptop or PC, you’ll be asked whether you’re connecting to a network at your home, work, or if it’s public as per graphic below. 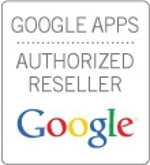 Each of these choices will dictate what level of security will be put in place. The public setting, naturally, will give you the most security. There are a number of other setting changes that will strengthen your security and we can discuss these in more detail if you contact our Technical Department on 01 – 2930363. If accessing Webmail on a public computer make sure to log off the webmail session and close the browser when finished. 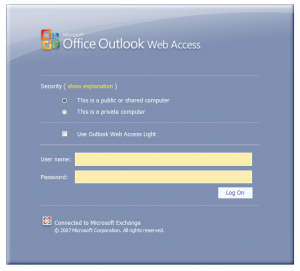 If using Microsoft OWA (Outlook Web Access) on a public computer be sure to click on the option “This is a Public or Shared Computer” as per graphic below, at the login page, this causes the session to timeout after 15 minutes of inactivity. If “Private Computer” is selected the session will stay alive for an hour. If sensitive data is being stored locally on a laptop that is used out of the office, data encryption should be considered. This will render the data useless (without the correct password) should the laptop be lost or stolen. If using removable media (USB HDD or Flash Drive) it is best if the disk can be encrypted or password protected in cases where there is confidential data stored on the disk and if in particular if it is taken out of the office or home. As always if you are unsure of any issues mentioned or wish further clarification, contact our office on 01 – 2930363 and speak to one of our Engineers.